The author discovered a cautionary tale in the making of the classic Russian soup, Rassolnik, involving Vodka, a rabbi and pickled cucumbers. Well over a year into this project, of recreating the Soviet Cookbook, I still love writing this blog. Granny and I speak every week to find an interesting recipe to recreate. Then I make the meal with various degrees of success, but the best part is hearing Granny’s stories from the past. Some I’ve heard before, while others are new and even more exciting. One such story is about my youthful grandmother trying vodka for the first time, or “twice” as my great-grandmother Mun’ka used to say; for the first time and the last. 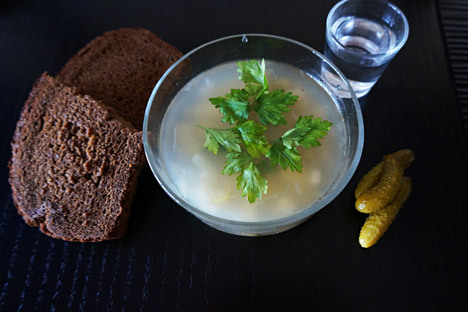 The story came up as we were talking about pickled cucumbers; a topic that almost inevitably leads to vodka; and I thought it would be a good idea to try making rassol’nik: a soup of kidneys and pickles. I couldn’t find, nor did I look for any kidneys, so I made the soup instead with beef. I added ‘rassol’, the pickled cucumber “juice” that gives the soup its name, as recommended by the Book, and it turned out very nicely. Rassol is a popular cure for a hangover in Russia, which is how bringing it up with Granny led to vodka. To start Granny’s story of her encounter with vodka, I will first share what she told me about vodka in general. Her grandfather, a rabbi in Kiev, would have a shot of vodka before lunch every day, “for a better appetite.” She described making “samogon” (moonshine) as “the favourite Russian entertainment.” She said every man in the Soviet Union was making his own flavoured vodka; with lemon, cranberry, mint or other flavours. Surrounded by vodka, my grandmother thought she’d give it a try. “I just wanted to understand how drunk people feel!” she said. My grandfather taught her the ultimate Russian wisdom: sniff the dark bread first, then take a shot of vodka, then exhale, and have a pickle and some dark bread. But the wisdom failed on Granny, and she never tried it again. So what if I just undid all the work I’d done to convince my non-Russian friends that we really don’t drink that much vodka? Eating rassol’nik (possibly for the first time ever) and talking to Granny about rassol and spirits was well worth it. Remove fat and film and cut each kidney into 3 or 4 parts. Wash, put in a saucepan, cover with cold water and boil. Then, drain the water, wash the kidney, cover with cold water and boil 1-1.5 hours. In the meantime, peel and chop the celery, onion and parsley and fry in butter in a soup pot. Remove the pan from heat, add cubed pickles and potatoes, add broth from the kidneys and boil 25-30 minutes. 5-10 minutes before the end of cooking, add rassol, chopped sorrel or lettuce and salt. Add the kidneys, sliced, before serving. Serve with sour cream. Rassol can also be prepared with meat or chicken broth and served with veal, lamb or chicken or poultry kidneys. Or , prepared with fish broth and a piece of boiled sturgeon or walleye.